(Nanowerk News) It's no bigger than a stamp packet but it has the potential to allow rapid development of a new generation of drugs and genetic engineering organisms, and to better control in-vitro fertilization. Engineering researchers at McMaster University have fabricated a palm-sized, automated, micro-injector that can insert proteins, DNA and other biomolecules into individual cells at volumes exponentially higher than current procedures, and at a fraction of the cost. This will allow scientists to vastly increase preclinical trials for drug development and genetic engineering, and provide greater control of the process. In a paper published in the current issue of Lab on a Chip journal, researchers describe the construction and operation of a microfluidic micro-injector, which achieved an almost 80 per cent success rate in injecting Zebrafish embryos. "This device is to drug discovery what the assembly line was to the automobile or the silicon chip to information technology," explains Ravi Selvaganapathy, assistant professor of mechanical engineering at McMaster and lead author of the research. "It turns what was a complex, resource-intensive process available to a few into an automated, predictable, reliable, and low-cost system accessible to almost anyone." (a) Zebrafish embryo immobilized by suction capillary. (b) Needle inserted into yolk sack. 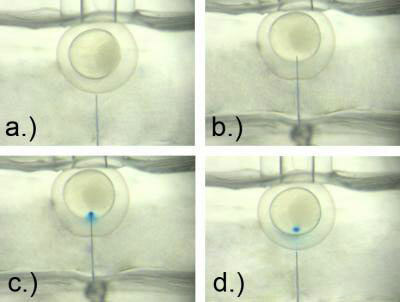 (c) Electroosmotic pumping of methylene blue solution into the embryo by the application of 25 V for 10 s. (d) Needle retracted from the embryo. The micro-injector has a cell-wide channel cast on a silicon chip that guides cells and embryos to the injection site. A similar channel guides the injection reagent to a needle as thin as 10 micrometers (one-tenth the diameter of a human hair). The researchers have developed a buckling method to drive the needle through a cell's pliable outer membrane accurately and to the proper depth. The injection dosage is controlled electrically, as is monitoring of the needle's position. The researchers have also developed methods to sharpen the needle, ensuring minimal injection damage or interference to the cell. Notably absent is the need for a microscope or optical magnification to conduct the process, which is required for manual injection and to monitor transfection methods. The microfluidic device also allows easy integration of post-processing operations including cell sorting and the testing of cell viability on the same chip. "Almost every researcher would be able to have this device at their disposal in their own labs," said Selvaganapathy. "The micro-injectors can easily be run in parallel and allow for scientists to test far greater combinations of materials in a much shorter time than current processes. It also makes it more feasible to pursue drug discovery for many so-called neglected diseases." The micro-injector also holds great promise for in-vitro fertilization as it provides far greater accuracy and control than current manual injections procedures, which have high rates of failure, require trained expertise and can be time intensive. Elimination of expensive optical magnification needed for manual injection or to monitor quality control.